At any rate, Tapas Barcelona is our pic for the month - a fixture in Evanston since 1995, but has had little exposure on this forum. If the weather is nice (you never know) there's a patio. Signature dishesinclude dates wrapped in bacon, grilled mussels and stuffed olives. We did discuss pre-ordering paellas, so I'll be bumping this thread a couple days prior to the event to confirm people's preferences. Last edited by Mhays on May 20th, 2008, 6:35 am, edited 3 times in total. And count me in for paella!!! It's on my calendar. See you all there. And that's a big "si" on the paella. Mhays wrote: If the weather is nice (you never know) there's a patio. There's also a swimming pool. Should I arrive in my swimsuit, or would the mere thought of that disgust everyone so much that no one would show up? Darn, I leave for New Brunswick (Canada) at noon. No swim suit for me. Helen and I will be attending. Helen and I cannot attend. I have a meeting that afternoon, which is causing a conflict. I will just have to wait for the pictures and report. Bump! Just a reminder, I'm going to call this in tomorrow, so if anybody else wants to pile on, now's the time! Sorry to post three times in a row - I just got a call back from Tapas Barcelona, and they're closed for a private party on the date we chose. Unfortunately, the rest of this week is out for me - anybody want to chime in with alternate dates (or I suppose we could go elsewhere on Wednesday) and we'll start over from scratch? What about Jamaica Jerk or Good To Go, both Jamaican restaurants on Howard Street (the first a block or so east of Clark/Chicago Ave, the second a block or so west)? We could try either of those Wednesday at 12:30, if enough people are ok with that. I defer to the group, but Good to Go would be good with me (esp. considering I can't really park any closer than where I keep my car anyway) and they've recently expanded, so there's plenty of seating. Last time we ate there, it was pretty good. This is not a request about the May meeting, but about June. I leave for the summer on Wednesday June 11th, and would be delighted if we selected a day between June 3rd and June 10th. Perhaps we could choose Tapas for that time. If not, I'll be back in August. I'm good to go with Good To Go. I'm a maybe for tomorrow. I'll know more at game time. Do you think Good to Go will mind the swimsuits? Well, guys - I tried to call last night (admittedly late, but still within their hours) and got a fax instead of a land-line. I found an email form on the website and sent it in. So far as I know, it's open and we don't really need a reservation, but just wanted to update everyone on the latest gufuffle. Confirmed! I told them between 5-7 people, and they said OK. Phew! Surprisingly, I got home first! At any rate, lovely to see those of you who made it, sorry to miss those of you who didn't (I hope nobody wound up stranded at Tapas Barcelona) We had a very nice lunch, during which I noted that my house is equidistant between Good to Go and BBQ Bob's, which accounts for how often we dine at one or the other. 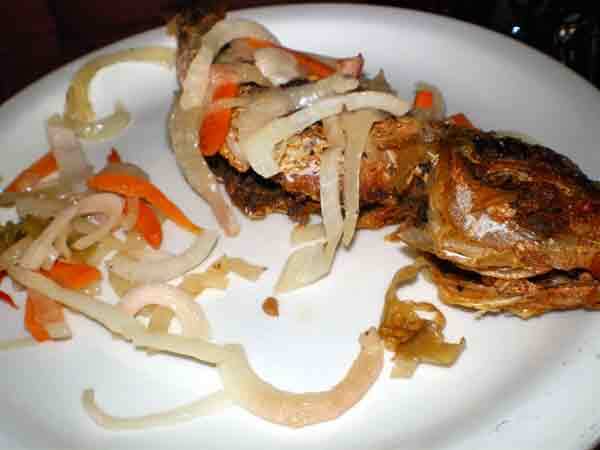 In particular, the fish appetizers, sort of a cooked escabeche, were very interesting - we had 2 butterfish and a goatfish which were apparently fried, then covered in a spicy vinegar/onion/carrot dressing. Unless this successfully deadened our palates, it was significantly more spicy than any of the other offerings. 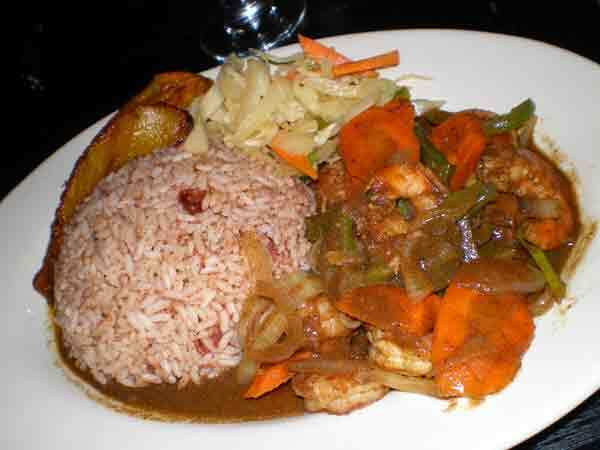 The juice (I had beet/carrot/ginger as they were out of cucumber) was delicious, and the jerks and curries fairly standard (not in a negative way) - though jerk shrimp was something I'd not seen at other area Carribean-influenced restaurants. Thanks to Michele for her adept two-step (must come from her theatrical training) in the last minute switch to Good to Go, which I found to be much nicer than expected for a small storefront Jamaican restaurant - as compared to the late Jamaica Gates, or Claire's Korner, for example. Obligatory, but still valid comment: the company was the best part of the meal. The time really flew. On to the food. The earlier-arrivals started with rather hearty soup of Chicken Feet and Dumplings. It appeared to be a bit tough to eat, since it required fishing the chicken feet out of the soup, and then gnawing on them with soup-covered fingers. But it was tasty. We chose two fish appetizers, and as Michele mentioned, both were rather (nicely) spicy. 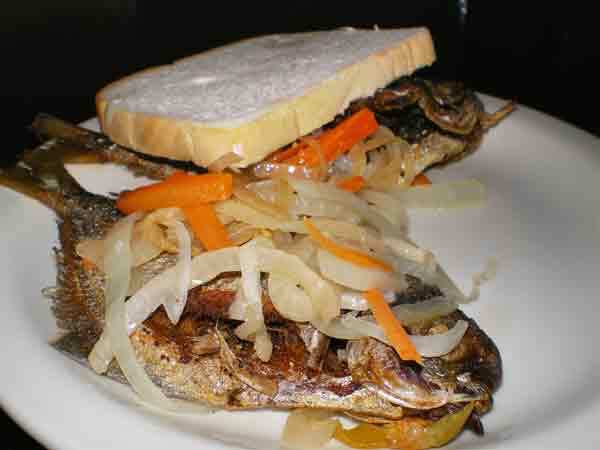 First was the Butterfish (with a slice of white bread - barbeque-style). I enjoyed the spice level, but I thought the fish was slightly over-cooked. While the butterfish itself had a very mild flavor, the Goatfish's flavor was much more pronounced. To my tastes, it was also slightly overcooked. All the entrees came with a healthy helping of rice and beans, and plantains. 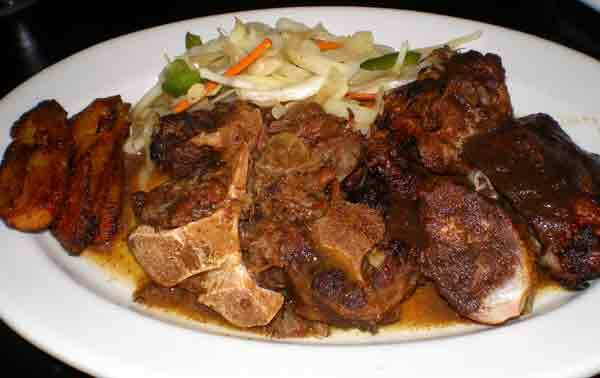 The oxtail was by by far the heartiest. I think my favorite dish was the Conch Curry. I encouraged the group to try it, then felt a bit of trepidation after the slightly overcooked fish appetizers. Overcooked conch can be like eating rubber balls. Fortunately, that wasn't the case here. The conch had only a slight chew to it, although the curry flavors were somewhat muted. I didn't get a photo of the jerk chicken. Good to Go is also known as a juice bar, and the juice drinks were generally impressive, with fanciful names. 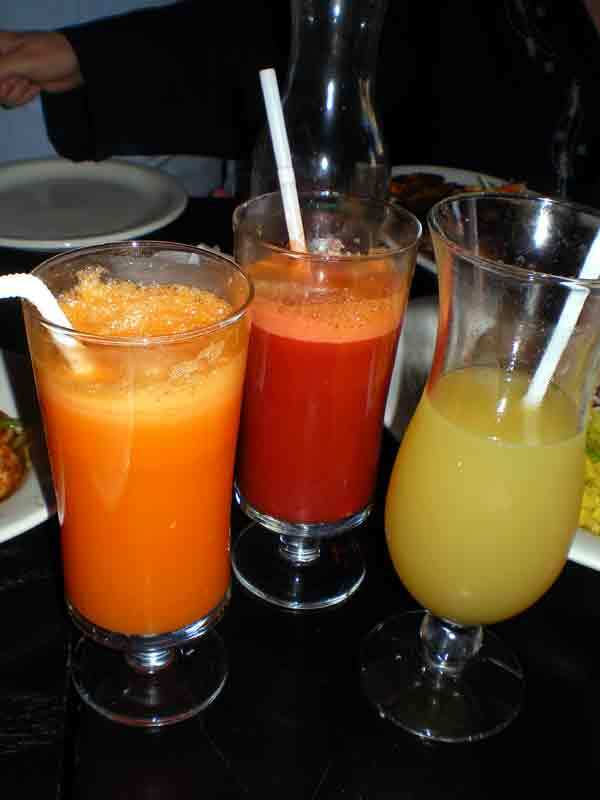 from left: One Love (carrot, apple and ginger), Eye Opener (beet, ginger and carrot), and (name escapes me - pineapple and ginger). In each case, a little more ginger bite would have been nice, but they were very good as they were. I had what was described as a house-made ginger beer. It had a bit more ginger kick, but was still somewhat on the mild side. Disappointingly, it came pre-packaged in a plastic bottle, although they insisted it had been made and bottled on premises. Although we didn't partake, I should note that Good to Go has a full bar. It also appeared they had speakers and a setup for live music. All in all, a nice place that was off my radar screen. I thank Michele and The French Couple for suggesting it. It almost made Robert's egregious puns tolerable. I'll probably go back soon. Note to Mike: they really didn't mind our swimsuits at all. I should add, in terms of reccomendations - Good to Go would be a nice place to take a date, as the interior is really slick and they have the full bar, etc. The food is certainly fine, although if you take away the aformentioned ambience, it's a bit pricey for what it is - by no means outrageously so; it's likely our $20 per person check had a lot to do with the $3 and $4 juices and sides. It's also fine for the spice-averse, though the fish was at my top level of tolerability. 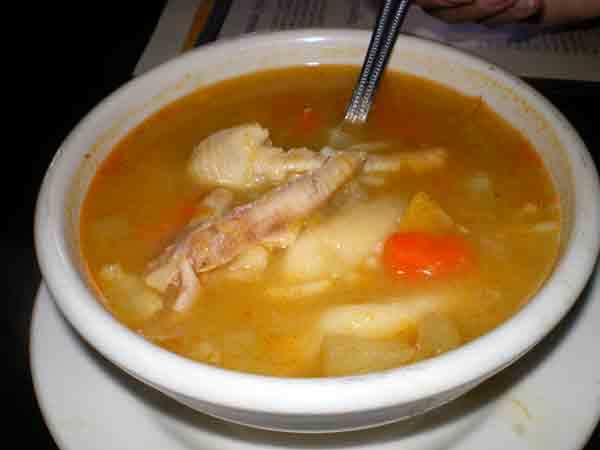 Last time I went, I had the Goat's Head soup, which was actually quite good - better than most of yesterday's offerings. 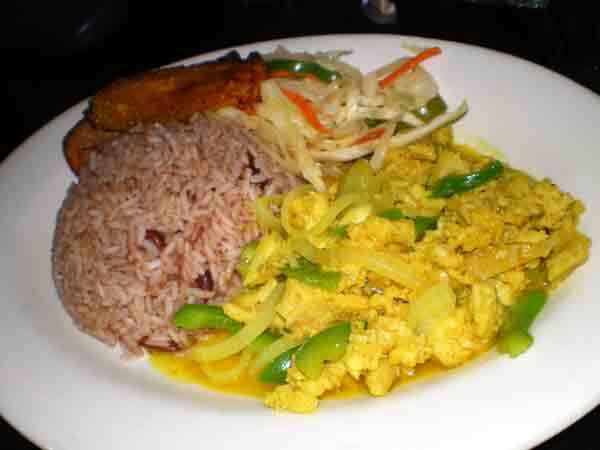 Honestly, though, I found myself wishing for the Oxtail Malcom and conch fritter at the almost ambience-free Tickie's. Thanks, Gail - I'll be sad to miss it, but considering both GAF and the Chapulins are very restricted in their availability, I think majority rules - I'm extremely schedule-restricted, myself, that week - as the last (extremely shortened) day of school for Sparky is Wednesday. At least it's not a first either in cuisine or location for me, or I'd be really bummed! Narrowly missed eating at Good To Go today, (not that I objected) but the community group I was with opted for Jamaica Jerk which was also surprisingly tasteful inside, and where the food was pretty good and reasonably priced (if a bit lacking in spice.) It was mentioned by a member of my group that the business is struggling a bit, so if you have a hankering, I recommend it. Mhays wrote: Narrowly missed eating at Good To Go today, (not that I objected) but the community group I was with opted for Jamaica Jerk which was also surprisingly tasteful inside, and where the food was pretty good and reasonably priced (if a bit lacking in spice.) It was mentioned by a member of my group that the business is struggling a bit, so if you have a hankering, I recommend it. A new place, Jamaica Jamaica, is opening near Grove and Sherman. I wonder if they're related to the Jamaican place that used to reside where Uberburger now sits. We'll see. Sorry I missed the company earlier this week. In case folks are checking this thread, note that the date for the upcoming Tapas lunch has changed to the 6th.